Tissamaharama: The Debunk of "Thissamaharama evidence for Tamil Civilization 2200 years before in Sri Lanka"
We have been surprised by the Tamilnet article about potsherd found at Tissamaharama premises, which they claim to be evidence for ordinary Tamil speaking people lived in Southern Province of Sri Lanka, 2200 years ago. It is very unprofessional to believe the existence of Tamil speaking civilization in Southern Sri Lanka based on some non-native inscriptions that were found at an ancient harbor. Though we read that article fully to understand what was going on. We are familiar with ancient Pre-Brahmin scripts which only found at Sri Lanka but not with Tamil scripts. 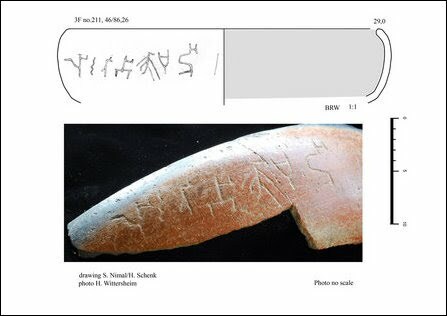 The article says that the letters on the potsherd is read as this “tiraLi (or tirali in ISO 15919)”. Did you notice? “The fourth and fifth ones are symbols or graffiti marks.” How likely someone would include an unidentified graffiti within an inscription for no reason? This is the point that increased our doubt about this so called evidence. Let’s take fourth letter. It's quite similar to Pre-Brahmin letter Na or Ni (with vowel symbol ‘i’ it makes “Ni” without sounding like “Na”) with some unwanted stripes at the bottom of the letter. Doesn’t it look strange? We are quite sure that the fifth letter is very similar to Sha or She (with vowel symbol “e” the letter sounds like “she” and without the vowel symbol, it sounds like “sha”) again with some unwanted stripes as before. Other than that, Tamilnet were quite right about other letters as it looks similar to Sinhalese Pre-Brahmin letters. People who are familiar with language Tamil, knows that Tamil alphabet does not have a unique latter for the sound “da”. Tamils use the latter “Ta” for both phonetic sounds “Da” and “Ta”. The last letter in the potsherd is very similar to the Sinhalese latter “da” with unwanted stripes. Remember, the Tamil alphabet does not have a letter for the sound “da”. To clarify what's really going on, we, Ravana brothers got together to study the inscription even further. Surprisingly, our president Dhammika Hettiarachchi pointed out that inscription had been tampered to prove their desires. According to his findings the potsherd should correct as follows. The lines with red highlights are from original inscription. But the lines with blue highlights are tampered latterly. This is the interesting part. If you read this inscription now from right to left, it sounds like “DaMaSheNa TeRaHa” (in Sinhalese "ධමශෙන තෙරහ”) which means It's belong to Dharmasena Thero(in Sinhalese ධර්මසේන ස්ථවිරයන්ගේ)... It is logical to think that the potsherd is a part of a bowl used by a monk, most probably Dharmasena Thero. It's so clear. This potsherd has been tampered. If you look clearly you can see new tampered lines are more clear than originals. This is not the first and definitely not the last time that they try to hide true history of Sri Lanka and create evidence to prove a Tamil civilization. Be careful and think twice before believing such fairy tales. Images and other copyright material belong to their respective owners. Article is copyrighted for Ravana Bothers. keep up the good work dasun and RB! I don't wanna wake up from your fantasy. Happy Dreaming!